Make-A-Wish is a charity dedicated to granting the wishes of children with life-threatening medical conditions to enrich the human experience with hope, strength and joy. Founded in January of 1986 Make-A-Wish has grown from being an answering machine in the founder's spare bedroom to a leading charity for children with chapters all around the world. Hulk Hogan has personally donated much of his time to this cause granting well over 200 wishes and was easily the most requested celebrity of the 1980s. While it would be impossible to make an entire list of all of wishes that Hogan has granted (Make-A-Wish has told me that they didn't even start keeping exact records until the 1990s) I wanted to add as many as possible. 1986 - Make-A-Wish founder Bob Cleveland recalls one of the earliest wish kids: Armando, from Central Washington, who wished to meet the world famous WWE superstar: Hulk Hogan. He will never forget the moment Hulk wrapped his championship belt around Armando's waist. 1986 - 12 year old Shannon Rose was born with a life threatening syndrome known as Ehlers-Danlos Syndrome (EDS). 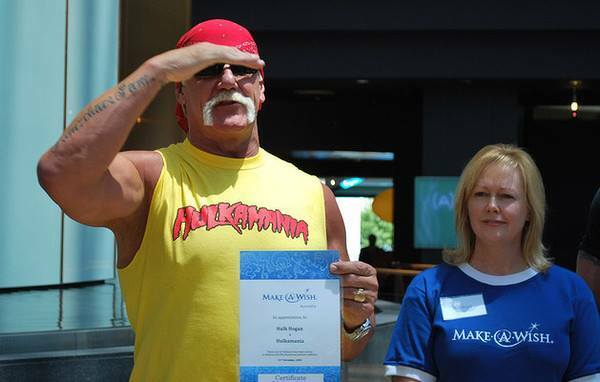 He was granted a wish from Make-A-Wish Foundation to meet his hero, WWF World Champion Hulk Hogan. That introduction brought him in front of the legendary announcer Gordon Solie and Pro Wrestling Legend “The American Dream” Dusty Rhodes. Together they helped Shannon begin his career as a professional wrestling ring announcer; Rose made his first appearance as a Professional Ring Announcer at the age of 14. Since his first appearance in the ring, Rose has managed to work with all the major wrestling corporations from ECW to NWA. Rose has also come out of the announcing realm to manage professional wrestlers like Kevin Sullivan, The Mighty Hercules, and Fidel Sierra “The Cuban Assassin”. 1987 - young Christopher Hamilton passed away from leukemia in 1987 but not before leaving his family memories and a chance to make his own when he met Hulk Hogan which was made possible by the foundation which the Hamilton family continues to support to this day. 06/29/02 - New York, NY - Madison Square Gardens: Hulk Hogan granted a wish to 10 year old Stanley Nicholas Sclavos who was diagnosed with Leukemia the previous year. Although He had previously gone in to remission after a bone marrow transplant and was preparing to go back to Australia, the young boy relapsed and sadly passed away the next year. 08/21/05 - Washington DC: A Mr. Daniel Jason Rivera posted on Hulk Hogan's Facebook page that Hogan granted a wish to a younger brother before taking on Shawn Michaels at SummerSlam. 11/20/09 - Canberra Australia: Superstar wrestler Hulk Hogan met his match from the tag team combo of Sports Minister Kate Ellis and a 17-year-old.